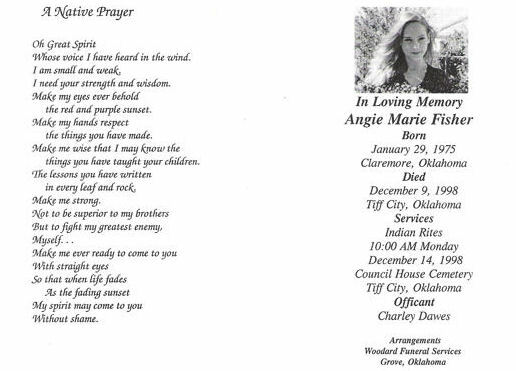 Angie passed away December 9,1998 due to the injuries she sustained in a car accidenent. She was a member of the Eastern Shawnee and the Seneca-Cayuga Tribe of Oklahoma. She had one child, Danika Fisher. Angie was the daugther of Daniel Fisher & Susan Kathleen Bear, and the Sister of Racheal Fisher.